Preheat oven to 220°C. Trim wing tips from spatchcock using kitchen scissors. Rinse skin and cavities and pat dry with paper towel. Cook quinoa according to packet instructions, then cool completely. Combine softened butter, lemon zest and juice, thyme and crushed garlic in a bowl. Season. Gently work your finger between skin and flesh of each spatchcock breast and thigh (careful not to tear skin). Spoon a quarter of butter mixture under the skin of each spatchcock and spread it over flesh. Place quinoa, grapes, walnuts, 2 tbs oil and 2 tbs verjuice in a bowl. Season well. Fill spatchcock cavities with stuffing, tie the legs with kitchen twine, brush skin with melted butter and season with salt flakes. Toss carrots, onion, bruised garlic, thyme sprigs, and remaining oil and verjuice in a roasting tray and season. Place spatchcocks on top and roast for 20 minutes. 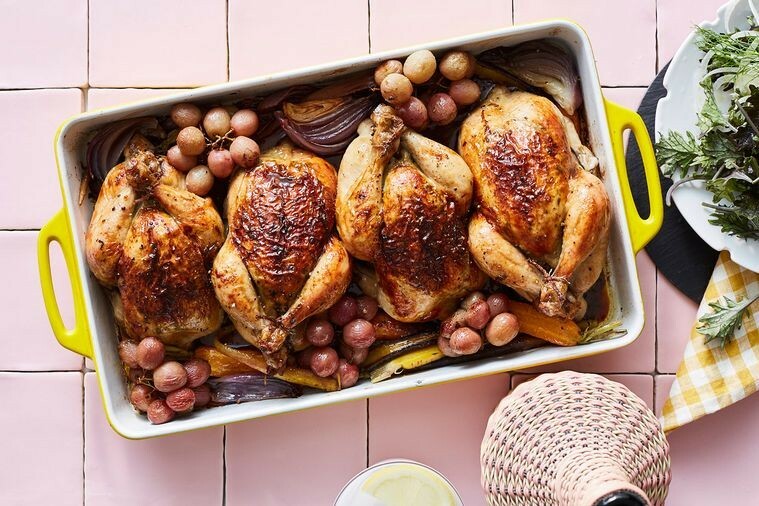 Reduce oven to 190°C, add grape clusters and roast for 25-30 minutes until spatchcock are golden brown and juices run clear when thigh is pierced with a skewer. Cover loosely with foil and rest for 20 minutes. Arrange spatchcocks on a platter along with roasted carrots, onion and grapes, drizzle over pan juices.